As I mentioned in a previous post, I’ve been able to conceive of and work on several new datasets with the advent of Logos Now. One of these new datasets involves an analysis and classification of Bible references found in original language grammars. One of the things that has frustrated me with reference library software like Logos is how close things are (all these books, all in one place) yet how far away they still remain. That is, I can be looking at a Bible verse, but reviewing and categorizing a list of the ways different resources discuss that verse is a whole lot of work. Since I’m in a position to find a solution to this sort of thing, that’s what I did. 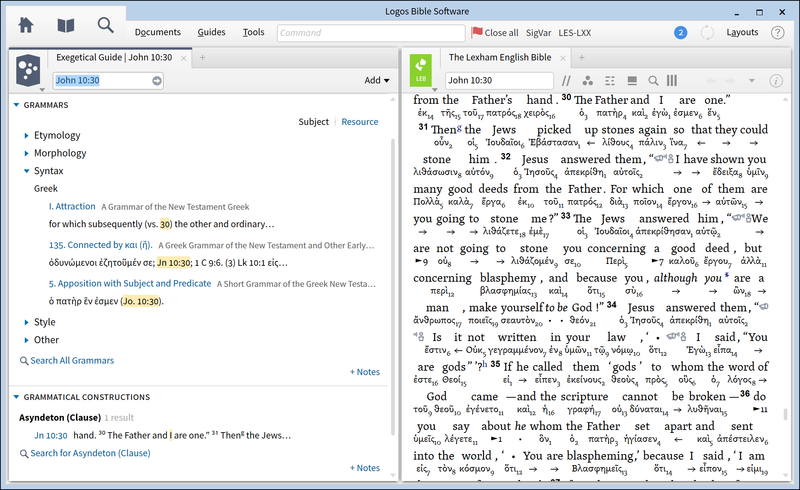 Logos Now includes a completely redesigned “Grammars” section in the Exegetical Guide that does exactly this. Further, we introduced a “Grammatical Constructions” section that highlights certain constructions found within the verse (currently NT only). As an example, I ran the Exegetical Guide on John 10:30, a short but significant verse: “I and the Father are one.” What sorts of things did I find, and how were they classified? The references in all original language grammars have been extracted and classified algorithmically according to a classification we developed. (More details can be found in this 2015 BibleTech paper). The references are classified by the language treated by the grammar they appear in and according to a high-level classification (items like Syntax, Morphology, Exegesis, Style). It means that I can now be in a Bible verse, like John 10:30, and find out what my grammars say about the syntax of the verse. Or what grammatical constructions appear in the verse (kudos to Jimmy Parks, who did much of the construction analysis). This means that the stuff which was possible but far away (categorization of Bible references in grammars in my Logos library) is now much closer and more usable. Stuff like this doesn’t happen in a vacuum. I may have had the original idea, but lots of folks helped sharpen it and implement it and make it what it is now. We have a great team at Faithlife / Logos to move tools like this from conception to reality. Maybe you should consider joining us. See more about available positions at jointheawesome.com. Oh, and Grammars aren’t the only thing that we’ve applied this approach to.